“Give a man fish and he will have a meal for a day. Teach a man how to fish and he will feed himself for a lifetime”. These words which were coined by the Chinese cannot be truer of Indo-Zambia Bank which First Republican President Kenneth Kaunda opened over 30 years ago. The bank was founded on October 19, 1984 as a shared vision between Dr Kaunda and late Indian Prime Minister Indira Gandhi. The two forged the bank as a joint venture between the Government of the Republic of Zambia and the government of India, which was represented by three Indian public sector banks namely; Central Bank of India, Bank of India and Bank of Baroda. Each of the three banks contributed 20 per cent share capital while the remaining 40 per cent was provided by the Zambian Government. Whereas in the last 30 years Dr Kaunda has aged and is no longer able to fend for the well-being of the country he fought to liberate, Indo Zambia Bank, among other institutions, has spent the last 30 years attaining growth to ensure that Zambia becomes economically viable and sustainable. 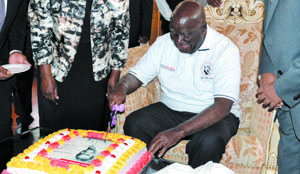 Honouring Dr Kaunda at his State Lodge house on the occasion of his 90th birthday in Lusaka recently, indo Zambia Bank managing director Shankardas Gupta commended Dr Kaunda for his visionary leadership in, among other things, establishing an institution that he said was “more than a commercial bank”. “The bank has emerged as a leading commercial bank in the country (Zambia) and today boasts a total business mix in excess of K2.4 billion supporting and supplementing Government’s efforts in the growth and development of commerce and industry,” he said. The growth of the bank, which was at 28 per cent in 2012, has been consistent in all aspects, including in the area of making profits since inception. This has been demonstrated by consistent payments of dividends to the shareholders who, in the last two years, have sacrificed their dividend receipts opting to redeploy the earnings to build up the institution’s capital and reserves. From the one simple institution which Dr Kaunda opened over 30 years ago, Indo Zambia Bank today is a complex bank that serves the public through a countrywide network of 25 branches spanning across all the 10 provinces. The branches include newly built ones which involved creation of direct and indirect employment of local people in their construction phase as well as old buildings that had to be refurbished to international bank-branch standards at colossal cost. To keep the countrywide branch operational, the bank has a staff establishment of over 300, and continues to provide job opportunities to local young graduates, 40 of whom were employed in 2013 alone. These members of staff are instrumental in the bank’s delivery of world class products and services that complement Government efforts in reducing poverty and empowering the local underprivileged communities. According to Mr Gupta,local community empowerment has been achieved through providing micro-finance schemes to self-help groups, especially those driven by underprivileged women, as a way of fostering financial inclusion. Over 1,328 women, representing more than 123 women groups, have benefited from a disbursement of K2.5 million. That figure was by March this year scheduled to rise as a result of an additional allocation that was earmarked for distribution to over 150 women. “With a credit portfolio in excess of K900 million, the bank is also making a significant contribution to employment creation through support rendered to small and medium entreprises (SMEs) and financing extended to employment stimulating ventures,” Mr Gupta said. The bank has approximately 9,000 accounts of SMEs which comprises 50 per cent of the institution’s loan output in its contribution to the growth and development of the SME sector that in turn creates employment opportunities. The bank, among other things, commands strong financial fundamentals with high net worth, high capital adequacy ratio, comfortable liquidity position and a good quality asset portfolio. Today, the bank has seen total deposits rise to over K1.5 billion while loans and advance portfolio ranks over K900 million. 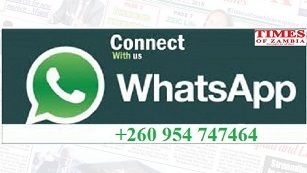 Besides assisting self-help groups and SMEs, the bank has continued to pay special attention to the mining and agriculture sectors as is evidenced by – among other things – the location of its new branches in places like Solwezi in North Western Province, which is said to be the next Copperbelt, and in Kitwe where specific economic activities like the opening of new shopping malls, are being served. The opening of new bank branches in places like Kasama has contributed to the increase of penetration of financial services among rural unbanked populations especially off the traditional line of rail where communities have for a long time lived without access to financial services. These are some of the ways in which the bank has served the country through its full array of commercial banking, foreign exchange and international banking products and services. On Government’s part, the bank’s branch expansion is laudable, given the investment and job creation that goes in each branch the bank opens. Addressing guests that witnessed the opening of an Indo Zambia Branch in Kasama a few weeks ago, Finance Minister Alexander Chikwanda felt it is not just jobs that come with such services: it is the skills diversification that the local population attains which matters too, because should the investment, for some reason or another falter now or at a later date, the local population would still remain empoweredand available to provide their skills not just to Indo Zambia Bank but to other banks, too, or to other employers in need of such skills. Besides that, branch expansion means economic growth which also means increase in commerce and industry from which Government earns revenue. This is especially true for branches being opened in places like Solwezi and Kasama where budding economic activities require availability of services like banking to attract investment in mining, agriculture, tourism and infrastructure development. But in addition to augmenting Government efforts in fighting poverty by supporting self-help groups and SMEs to create employment, Indo Zambia Bank has partnered with the Government in implementing initiatives of national importance such as direct deposit of Government revenue in respect of fees payable for passports and travel documents which is done at the bank’s special counters in a number ofbranches. It is through achievements of banks such as Indo Zambia that the Government has felt the need to continue providing measures aimed at fostering growth of the financial sector in the country by enhancing good corporate governance. Ultimately, Indo Zambia Bank has done what no other commercial bank does: it has contributed towards galvanising the warm and brotherly ties between Zambia and India that have transcended generations. Indeed, at the age of 90 and in the evening of his life, Dr Kaunda will be remembered for establishing institutions that will look after his people for another 90 years to come, years that Zambia may have to face without Dr Kaunda.